Weezer frontman Rivers Cuomo is resting at a hospital in Amsterdam, New York. Band's Web site thanks driver for "keeping things as level as they could be"
(CNN) -- Members of the rock band Weezer are thankful for their tour bus driver, who significantly reduced the amount of damage in what could have been a much more tragic accident Sunday morning. 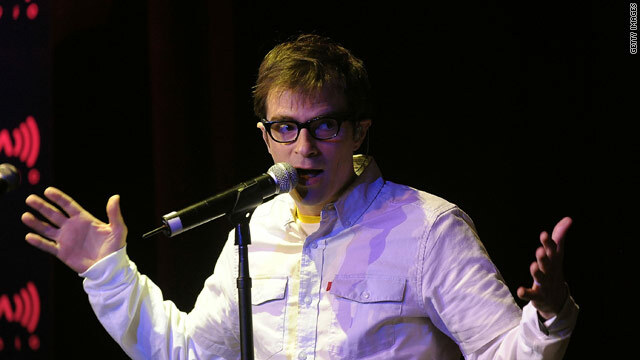 Frontman Rivers Cuomo and an assistant were injured when their tour bus plunged 10 feet into a muddy ravine about 40 miles west of Albany, New York, according to a report on the group's Web site. "The Weezer tour bus carrying Rivers and his family and assistants lost control as it hit a patch of black ice," Weezer's webmaster, Karl Koch, who arrived on the scene 20 minutes after the crash, wrote on the band's official Web site. "The driver employed every ounce of skill he had in fighting to keep the bus upright, as the vehicle violently fishtailed over the highway. Kudos to the driver for somehow keeping things as level as they could be -- surely this story would have been far more tragic if not for his actions." The Weezer tour bus, carrying Cuomo, his wife, daughter, their nanny and his assistant, was traveling from Toronto, Ontario, to Boston, Massachusetts, for a Monday night show when it hit black ice. The bus went off the freeway and plunged nearly 10 feet into a muddy ravine, according to Koch's report. Rivers' wife, Kyoko Ito, their 2-year old daughter, Mia, who was in her crib unit, and the nanny were uninjured. Cuomo was sleeping in the bus's back lounge and was violently tossed around by the impact. "He recalled not hitting anything, but later we learned that he must have, as he cracked three ribs and sustained some mostly minor but very painful internal damage, as well as hurting his lower leg somehow," Koch wrote. The front door of the bus was inaccessible because it was covered in 5 feet of mud. Local EMTs used the jaws of life to remove the bus's rear window to reach the injured Cuomo. Cuomo's assistant also suffered two fractured ribs and a fractured lower vertebra. According to the report Cuomo is resting comfortably at a hospital in Amsterdam, New York, and will not need surgery. The band has canceled the rest of its December tour dates.